If you want to give access to your logs to a software or automatize some tasks depending on your logs. You will maybe need to access them through the API. The most secure way to do this is to use tokens. With Logs Data Platform, there are 3 ways to query your logs. The Elasticsearch API located at the port 9200 of your cluster (find its address in the Home Page) against your alias. So you can pop up a Kibana or a Grafana or even a terminal Dashboard for Graylog. All these accesses are secured by your username and password. But what if you don't want to put your Logs Data Platform credentials everywhere? You can just use tokens to access all these endpoints and revoke them anytime you want. This tutorial is here to tell you how. 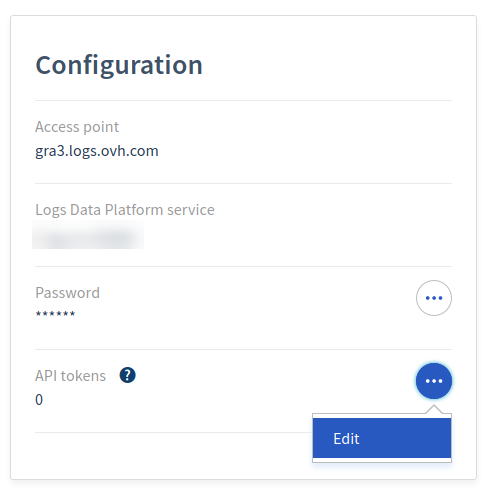 Once you have logged into Logs Data Platform you will have to access to the token Generation panel from the Configuration box. On this page you will have the possibility to create a token and to remove them. Note that you cannot modify a token. One goal with token is to automatize APIs call. Sometime you even need to automatize token creation. That's why it is possible to create token by using only the OVH APIs. If you're familiar with the OVH API, it should be fairly straightforward, if you're not, this section will help you with it. Generating tokens is two API calls away. You can use the OVH API console to make theses calls. Return the service object of connected identity. Return the list of service tokens. Here is the final response you will get. The token value is the value field. That is the field you will need to use the Logs Data Platform Search APIs. $ curl -u kujg9g227qv0123mav3s0q4pra4psqsi5leka6j7lc62qdef58q:token -XGET "https://<your_cluster>.logs.ovh.com/api/search/universal/relative?query=*&range=2592000&filter=streams:a123aebc12345623aafd"
Note that you have to replace the stream value in the filter parameter by the Id of your stream. To issue a search against the Elasticsearch API, you also use the same credentials. $ curl -u kujg9g227qv0123mav3s0q4pra4psqsi5leka6j7lc62qdef58q:token "https://<your_cluster>.logs.ovh.com:9200/<your_alias>/_search"
This call will launch a quick search (to retrieve the count and a sample of your documents) against the alias your_alias. Replace the alias by the one you have setup in you Logs Data Platform console. Note that these credentials are usable in place of your account credentials in Kibana and Grafana (or any tool that support Basic Authentication with Elasticsearch). The only place you cannot use your token is the Graylog Web Interface.